Features THIS SPACE HERE interviews with Jacinda Mack, First Nations Women Advocating Responsible Mining (FNWARM), and with Glenn Grande, Fair Mining Collaborative (FMC); ARTICLES by Robert Galois, Thomas Mills, Brian Pegg, Andrew D. Nelson, and Tara Lamothe-Ammerlaan, Daniel Brendle-Moczuk, Glenn Grande, and Amy Cook; and a FILM REVIEW ESSAY by Tyler Hagan. Daniel Brendle-Moczuk is the geospatial and social sciences data librarian at the University of Victoria (BC) and has interest in all thingsgeospatial. that may be needed in dealing with mining concerns large and small. Previously, Amy conducted similar work through the Centre for Science in Public Participation and the state of Alaska. Currently you’ll find Amy deeply involved in creating a Fibre Shed on Vancouver Island, in her garden, or dyeing, spinning and weaving in her studio. Amy lives in the Comox Valley, BC and holds an MSc in Fisheries Management and Statistics from Oregon State University and a BSc in Natural Resource Management from University of Michigan. Robert Galois began his academic career in Canada with a study of gold mining in the Cariboo region. 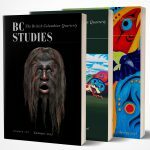 Since then he moved on to studying the encounters between First Nations and settler society in British Columbia. He has taught courses on this topic (mostly at UBC) but more of his time has been taken up with working for First Nations (including the Haida). This has involved preparation of reports for Specific Claims and Title Actions, and occasionally appearing as an expert witness. Glenn Grande has a Juris Doctorate from the Peter A. Allard School of Law, UBC, with a focus on Aboriginal Law, inherent rights, and self-determination. He holds a Bachelor of Arts degree through Thompson Rivers University and a Bachelor of Education degree from Vancouver Island University. A certified teacher, Glenn has taught all grade levels in First Nations communities throughout British Columbia. Glenn is of aboriginal (Cree) ancestry and volunteers on the board of directors at the Vancouver Aboriginal Community Policing Centre. At the VACPC, Glenn supports services, programs, and aid for the Aboriginal population of Vancouver’s downtown eastside and collaborates to resolve the challenging relationship between Aboriginal people and the police, not only in Vancouver but throughout BC and Canada. Glenn is also a former magazine publisher, and served for three years as a soldier in the Canadian Armed Forces. Tyler Hagan is a Canadian-Métis filmmaker based in Vancouver, BC. His producing credits include Never Steady, Never Still (2017), and the shorts No Words Came Down (2011), JIMBO (2013), Never Steady, Never Still (2015, short), all of which have premiered at the Toronto International Film Festival with two being selected by TIFF for Canada’s Top Ten. His directorial work has shown at Berlinale and includes work with the NFB, CBC, and the Museum of Anthropology. He is currently a Master’s candidate in History at the UBC and received his BFA in Film from Simon Fraser University. Tara Lamothe-Ammerlaan is a project manager with the Fair Mining Collaborative. She is Métis, from Treaty 8 territory in northern Alberta. Tara earned her Honours BSc in Biogeography from the University of Toronto and currently lives in Comox, BC. Thomas Mills recently completed a Master of Arts degree in History at Concordia University. His research is currently focused on the informal legal practices of mining communities in the Pacific Northwest during the mid-to-late nineteenth century. He is a candidate for a Graduate Certificate in Digital Archives Management at McGill University’s School of Information Studies. Andrew Nelson has had a lifelong passion for chasing water. As a fluvial geomorphologist with Northwest Hydraulic Consultants, Andrew works constantly to understand the world’s rivers, specializing in quantitative geomorphic assessment linking sediment transport and channel morphodynamics. Human impact on these processes has been tremendous and so seeking to understand variability in sediment supply leads him into occasional forays into the fields of historical and environmental geography. The impact of placer mining in the Fraser River basin has been a particular interest of Andrew’s since his graduate work studying the topic at UBC from 2008 through 2011. Brian Pegg is a faculty member of the Department of Anthropology at KPU. He is director of KPU’s Applied Archaeology Field School and has mentored many students who have gone on to careers in archaeology and anthropology. He lives in Vancouver with two cats, a physical anthropologist, and a baseball-playing teenager.